Like Ann-Christine, I love the traces of history in weathered and worn places and objects. If I listen carefully, I can hear their stories and secrets. So, for this week’s Lens-Artists Photo Challenge #38, I’m sharing some of my favorite “weathered or worn” images. The suitcase in this first photo was carried by a Japanese-American internee in the early days of World War II. Its battered exterior tells the story of a sad time in United States history when immigrants from Japan were imprisoned because of the fear that they were enemies of the United States. I can only imagine the sadness of the people whose loyalty was questioned after years of putting down roots in the United States. Many of them had little time to pack their belongings and get on buses and trains to remote parts of the United States. When we were in Rome, this shop window filled with broken dolls caught my eye. Not surprisingly, this shop is a doll hospital. These dolls show the traces of wear and tear by many loving children. I can only imagine how happy these children are when their dolls are fixed and returned to them. Exploring the Belém district in Lisbon is stepping back in time. It is one of the oldest sections of the city, down by the harbor, with many historical monuments and buildings that have been lived in for centuries. I loved the juxtaposition of the pictures of modern hairstyles with centuries-old architecture. In the Alfama district in Lisbon, these tiled facades tell the story of when the Moors occupied the city and shared their knowledge of science and crafts like tile making. Their faded beauty is still enchanting. Portuguese Doorway in Alfama, Lisbon. This final shot, taken of the jail in Port Arthur, Australia, shows the effects of almost two centuries of wind and stormy weather in this remote spot. The front steps were worn smooth by many prisoners’ feet. Thanks, Ann-Christine, for letting me highlight some of my images of older buildings and objects, worn and weathered by time. I love learning about their secrets and long history. 🙂 🙂 What happened to the rest of the bodies!! I’m afraid to ask. The stonework looks really nice in your last photo.. I was surprised as I would think the building was constructed with convict labour. Enjoyed your photos and the variety of locations! Excellent entry, Patti! Lovely shots and the beauty of weathered and worn buildings and objects really gets to me. The Japanese suitcase has its own sad story. The B&W is a perfect choice for that shot, but I quite agree with TCast about the dolls – the first impression is a bit scary, but when I take a closer look and know what it is all about, it is an amazing shot. Lastly, the feeling in Port Arthur must be quite overwhelming – all those prisoners, all those years. Love your choices for the challenge. Yes, absolutely, AC. I agree about the suitcase and the dolls. Port Arthur is an amazing place. It was a bit overwhelming and so sad. But ultimately those prisoners became Australian citizens. I wonder about the immigrants that are imprisoned today. There aren’t many happy endings, I’m afraid. Nice variety for your worn/weathered post. also, the doll hospital window was a little creepy – but I bet some of those old dolls are worth big money to the right collector. Interesting. He really has an eye for the unusual and what will sell. One of my uncles does that too. A real talent. Hi, Janet. Thank you!! 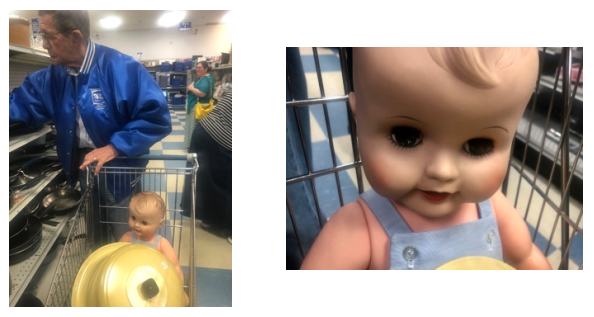 You are not alone in finding the doll heads very creepy. I was so startled when I saw them piled up in the store window! Thank you, Tina for your kind words. 🙂 The suitcase spoke volumes. A sad chapter in our history. These arte beautiful photo selections for this theme. Each has its own stories, especially the suitcase. he tiled facades are still enchanting, indeed. The suitcase stopped me in my tracks. I’m glad you commented on that one. I wish I could use those tiles in my home–when we finally land somewhere!! Wonderful collection of weathered and worn. I always find decapitated dolls heads disturbing but since they are there for repair I felt better. Thanks for giving that info for that photo. I love these kind of pix especially the weird doll head one haha! It is weird, isn’t it, Luanne? But I’m glad it captured your interest. When I peered around the corner and saw the owner of the shop fixing dolls, I was relieved!! It had to be a doll shop of sorts or a serial killer. Not much in between for that photo! May I post that pic on my Facebook page since it’s signed? With your blog link. Lovely choices. Belem is the only one I know first hand, and you got that district down pat. Thank you, I.J. Belem was fascinating. So you know it too? Isn’t it well worth a visit? Yes, definitely worth the visit. Like others i find the doll parts in the window a bit creepy (i wonder why that is) but it is a great shot for the theme. Old buildings are always fascinating. Yes. Headless dolls are a bit creepy!! The window really caught my attention! Wonderful photos – I love the beauty parlor!! Splendid examples of weathered and worn, Patti! I like the very subdued advertising at the hair salon. It’s nice that they didn’t ruin the overall effect of the building with a lot of unnecessary signs. Hi, Sue. Thanks so much. I like that–subdued advertising! Patti, the variety of your images tells a story about the challenge and you, nicely done. Hi, Jackie. The doll hospital was at the end of the street where we were renting. I hurried by the place for a few days, but when I found out they were fixing dolls, I breathed a lot easier!! 🙂 I hope all’s well with you. 🙂 Thanks as always for your thoughts. No shortage of sunshine or inspiration here, Patti, and i’m sure it’s the same for you. 🙂 🙂 At some point, you’ll find a place to call home? Any clues where, yet? I like your interpretations, even if I find the dolls a bit creepy. I happened to create a response that touches on WWII as well, so it is really your first image that spoke to me the most. Creepy, indeed! I was half afraid to see what kind of shop it was!